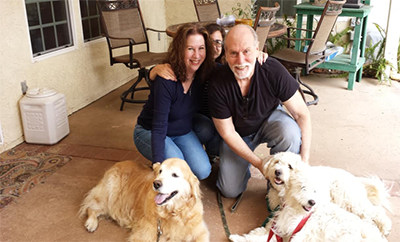 The Tess McIntyre Foundation, through its GoFundMe campaign, has been providing Welcome Home Rescue Packs for dogs adopted through Southern California Golden Retriever Rescue (SCGRR). The rescue packs consist of a bed, a collar and leash, and a 3-month supply of flea and tick prevention medication. These rescue packs are provided for a safe and healthy environment for the animals as they move into their new homes. Learn more at our GoFundMe page. Here are some of the rescue dogs who have benefitted from our campaign. These two 11-month old boys were being hoarded before they were rescued by Downey, Calif., shelter animal control officers. In a hoarding situation, someone accumulates more animals than they can properly care for. SCGRR placed them in a foster home where they discovered how much fun it is to run and play in the grass. This made the pair a perfect addition to a Woodland Hills family who adopted both and were looking for a playmate for their 10-year old dog Zoey. They found a perfect fit in these two guys who they renamed Lucas and Beau. Like many of the dogs who end up in shelters, Gunner was turned in by his owners. In this case, they decided it was a bad move to have a playful, one-year-old Golden, in a home with two toddlers and a newborn. 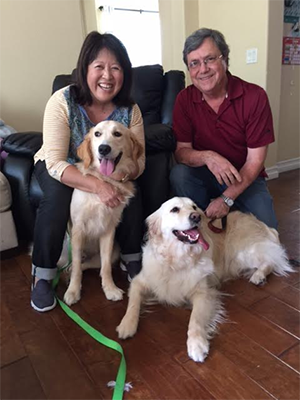 Fortunately for Gunner, he was a perfect match for a new family whom were looking for a companion for their playful 2-year-old Barley. When Gunner and Barley met, they hit it off immediately. And they’ve been playing ever since.